Construction works on the site of the planned tram depot in Presnya district began in 1909. Due to financial problems, the construction was ceased in 1912. There were plans to complete works and start service in autumn of 1914, but with the beginning of World War I the depot facilities were converted into hospital. When the war was over, the tram depot construction resumed. At first the depot started with restoring of scrapped tramcars stored in the nearby yards (there were too many trams out of service due to lack of maintenance during the war years and the following revolution and civil war). First restored trams began regular operation in 1919, and by 1922 the depot had 89 fully operational trams. The following decades were rather successful for the depot and its personnel, the number of vehicles increased steadily, and the service quality was one of the highest among the Moscow tramway depots. 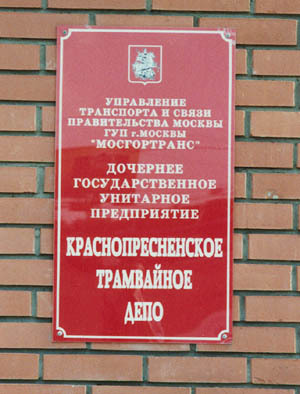 For many years the main gates of the depot were located in 1st Zemelniy Pereulok. When a tramline in 1905 Goda Street was closed in 1959, a new line to the depot was constructed under the Vagankovskiy Bridge. One of the very bad days for the Moscow tram was July 25, 1973. That day a tramline in Bolshaya Gruzinskaya Street was closed, and Krasnopresnenskoye depot with all its routes was cut from the main network (check the map on main page). All the following years it continued tram service on the north-western "island" of the tram network of Moscow. The situation had lead to many problems with depot operation as it became cut from main repair facilities and spare parts storages - but it helped to create the best independent depot-based maintenance service. I invite you to take a brief brief excursion to the depot - to see what it used to look like, and what it represents today.